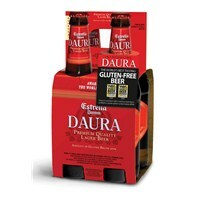 For the third year running, Estrella Damm Daura was awarded the World’s Best Gluten-free Lager Award at the World Beer Awards in London, after already having received it in both 2008 and 2009 (there was not a gluten-free beer category in 2010). This beer is the result of a long collaborative research process between Damm and Spain’s CSIC (National Scientific Research Council) gluten unit, using the most advanced technology. So what does this mean for the consumer wanting a gluten-free beer? A great tasting light beer with Gluten content below 3 PPM.